During the excavation, everyday life is quite tough. We get up early in the morning and ascend Psiloritis; a bit sleepy, to be honest, but ready to conquer the world for one more day. We are all eager to start working on our trenches, which are going to reveal more traces of the past—a past that, without a shadow of a doubt, was glorious 3,600 years before present, as indicated by the number and wealth of finds already unearthed at this site. Excavating, however, is far more than digging for artifacts. It is a carefully planned destruction of a site—because once the site is dug, it no longer exists. We record as many details as possible, preserving not only the artifacts but many, many other types of information, by using our knowledge of various disciplines, along with sophisticated technologies. In this way, the site is not lost forever, but can be reexamined through the notes, maps, samples, drawings, photographs, videos, and other data collected during the excavation. Meanwhile, we impart our knowledge to the hundreds of visitors that are guided through the site each summer. Although Zominthos is not yet open to the public, many groups are guided through the site during the summer months. Here, Yannis and Efi Sakellarakis speak with visitors. Archaeology offers the opportunity to learn new things every single day, whether in the field or the lab, by analyzing the results of investigations. We are a combination of Indiana Jones and Agatha Christie’s detectives Hercule Poirot and Miss Marple. With lots of luck and archaeological instinct, we reveal the mysteries of the Cretan mountains, travel back in time, and transport ourselves to some unusual and enchanting places. Conservator Myron Nikakis reconstructs a broken vessel. Zominthos is a charming place where all the features of Minoan archaeology are amalgamated, which is why we need to be careful as we excavate, not to miss any piece that could be added to the puzzle of the archaeology of the mountains. Using toothbrushes, paintbrushes, knives, pickaxes, and scoops, depending on the way we want to excavate, we try to gradually discover traces of highlanders’ real life and merge the elements that lead to a better understanding of the Minoan tranquillity. Marinos Fasoulas uses a railroad constructed on the archaeological site to quickly remove stones and soil. I believe that last photo, of the circular area bordered by stones, would be called a “threshing floor” in American English. Thank you for the wonderful pictures! This is an interesting and informative web site. It is exciting to see that you’re working hard and discovering much about the ancient Minoans, a people about whom we know much less than we would like. I hope your work continues to go well; please keep us updated on the site. yiasou. my father is from iraklion and i have visited knossos in 1965 and 1973. it is time i went back and perhaps have the opportunity to visit this site as well. very nice web site, video and narration. As a natural dyer, I have been fascinated by ancient peoples and their colors. Crete has long been a dream to visit, and to see excavations such as pictured here would be wonderful! This website is absolutly amazing! I never thought I would be able to get a taste of a dig on Crete without setting foot on the island. The information given is utterly facinating and I can’t wait to see more! Thank you and best of luck! Thank you for your comments!! More information will be posted this summer…The new excavation season starts on July…Stay tuned!! This is a wonderful site and the photos from the field notes are amazing. 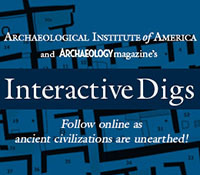 As a student of archaeology I am interested in Excavation techniques also. I was wondering over the use of small flags in the trenches. Would you please clarify why these flags are used. Besides how the matrix is made in the excavation method used in this project. cool i thought they were awsome turns out they are really awsome i mean they get to find bones COOL!!!! Thank you for your valuable comments. @ Deepak K Nair: We excavate by using the German excavation technique in contrast to the English single context recording system. We excavate in layers and we assign group numbers (a group of common features, either in soil, or finds). Which flags do you mean? @ dex: Since the excavation is made by a Greek team and recording is done only in Greek is difficult to recruit non-Greek speaking people…However, everyone is more tahn welcome to visit the site! Do you allow volunteers on your dig? I would be very interested. I am only just beginning my student journey into the field of archaeology and must say that I get quite excited about looking into the different cultures and the way they lived. I love your website and I hope in the future if I ever get the chance I will certainly visit. Good article, thanks and we want more! You mention at the very beginning having to climb the mountain. What is the reason for not just camping on the mountain? We are not actually climbing the mountain since there is a road leading to the area of excavation. At 1200 metres, weather conditions are a bit harsh to stay there day and night for such a long time, and therefore we prefer to stay at Anogia, a village 9km away from the site.